Posted by Iris Yan on 1/8/2019 9:00:15 AM. 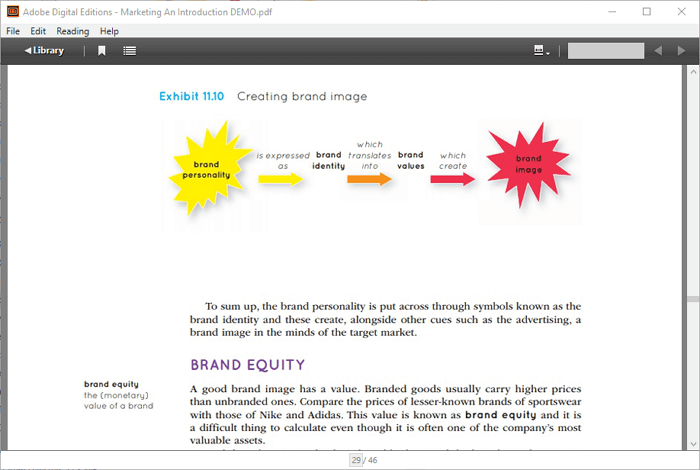 VitalSource Bookshelf is one of the most widely used etextbook platform around the world. Why it is so popular among students? One of the most improtant reason is that VitalSource is co-founded by major textbooks publishers Cengage, McGraw-hill, Pearson, MacMillan, and John Wiley & Sons, and integrated with learning manage system at over 100 institutions and colleges. It claims itself contains 90 percent of the core books used in higher education, and priced at 70% lower than the print versions. It is true that you can always get the book you want at a much more affordable rate at VitalSource than other vendors from the student’s comments. 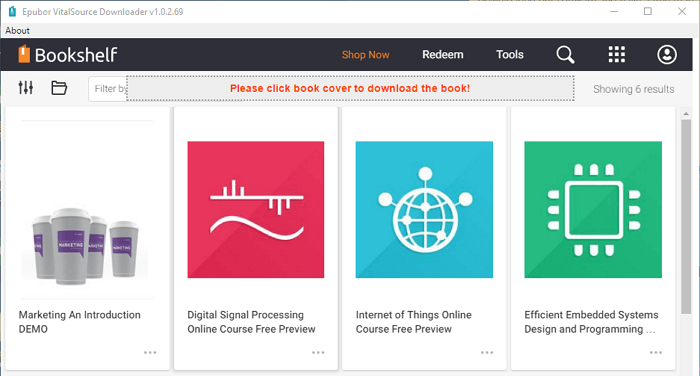 As there are so many students purchasing or renting digital textbooks from VitalSource, backing up VitalSource Bookshelf eBooks becomes the major concern. In this article, I will discuss why do we need to back up the VitalSource eBooks and how to back up VitalSource eBooks? Why Do We Need to Back up the VitalSource ebooks? After doing some investigation, here are the three main reasons that people want to back up VitalSource Bookshelf eBooks. Reason 1. Renting the VitalSource eBook instead of buying it. The VitalSouce offers both rent and purchase options but the purchasing price is highly expensive than renting. So most of the students prefer to renting VitalSource eBook other than purchasing. The renting period is flexible from 90 days to one year. Extensions are not available for VitalSource eBooks rentals. The only way is to re-rent it. In this situation, you need to pay another round of renting fee. If you have backed up this book, there is no need to rent the book again. Reason 2. VitalSource eBooks only can be downloaded to limited devices. According to the FAQ of VitalSource Bookshelf, you can read your VitalSource ebooks at any computer, tablet or mobile phone. Actually, the truth is that you can only access and download your rented or purchased eBooks onto 2 computers and 2 mobile devices. If you are frequently switching from different computers or devices, this restriction is really annoying and unacceptable. That’s why we need to remove the DRM from VitalSource eBooks and back them up. Reason 3: Reading experience with VitalSource Bookshelf is not very satisfactory. Many VitalSource users complain that they do not want to read the eBook with the VitalSource Bookshelf software. Compared with other eBook readers, VitalSource Bookshelf has very old design with barely functions. Although it allows you to bookmark and highlight, and export these highlights, the process is miserable. Some time, it will cut off the sentences, paragraphs or just a word when you are making highlights. Why not remove DRM from VitalSource eBooks and back them up so that you can use other eBook readers to read them? For the better reading and studying experience, we really should back up VitalSource eBooks. Now you must be curious how we can back up VitalSource eBooks. In the following part, I will guide you how to back up VitalSource eBooks step by step. How to Back up VitalSource eBooks? Just like other eBook vendors, VitalSource also employs very strict DRM scheme to protect their books. That’s why many people have downloaded VitalSource eBooks, but still need to read them with VitalSource Bookshelf. To back up VitalSource Bookshelf eBooks, we need to remove the DRM from VitalSource eBooks and convert the VitalSource vbk to PDF/EPUB. You can achieve the both goals with only one software—Epubor VitalSource Downloader. As the best VitalSource DRM Removal, it can not only strip DRM from VitalSource eBooks, but also convert VBK to PDF/EPUB. Step 1: Install and launch Epubor VitalSource Downloader. 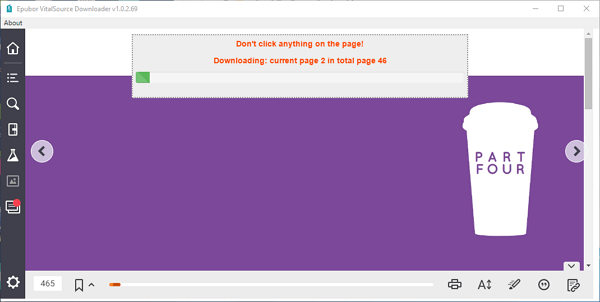 Step 2: Epubor VitalSource Downloader actually is a downloading tool for VitalSource eBooks. Once you have launched it, you will be required to fill in your VitalSource account information to sign in your VitalSource Bookshelf. Then you will see all your purchased and rented books displayed at your Bookshelf. Step 3: Click the Book cover to download the Book you want to back up. There is a processing bar at the top center to show you how many pages are in the queue for downloading. Please wait patiently! Once the downloading is finished, a new message “Download File Succeeded!”. Click “ok” button, the folder stored the downloaded VitalSource eBooks will pop up. To be mentioned, the downloaded VitalSource eBooks is DRM-FREE PDF/EPUB file, not the DRM-protected VBK file. The downloaded process combines the DRM Removal with the eBook conversion. With only 1 click, you can remove the DRM from VitalSource eBooks and download VitalSource VBK to PDF/ePUB. Now you get the DRM-free PDF/EPUB file stored at your computer so that you can read it any time with any PDF/EPUB supported reader apps or eReaders. Here you can see that I am reading my VitalSource eBooks with ADE. If you still have books purchased from other eBook vendors like Amazon, Kobo, Nook & Google Play, here is the solution to back up eBooks. What kind of pdf is created? Are the pages of the book just images converted to pdf-format or is it a true searchable pdf? If the original vbk book is pdf format, then the output format will be PDF too but is not searchable.